Recently I attended a cooking class at the Culinary Arts Center at Hilton Head Health. The CAC facilities were totally renovated in 2011 into a larger space with top of the line EVERYTHING. Hilton Head Health has been in existence over 35 years, helping those struggling with weight issues AND individuals (and groups) who would like to focus on a healthy lifestyle. By addressing the mind-body connection between weight loss, fitness, nutrition and overall well being they supply the tools to sustain a healthy weight-loss. They were featured on the A&E weight loss docudrama, HEAVY. This is the classroom. Each station has a professional range, sink and even pot fillers. At front is the huge stone “island” demonstration area – large monitors make following along with the chef easy. 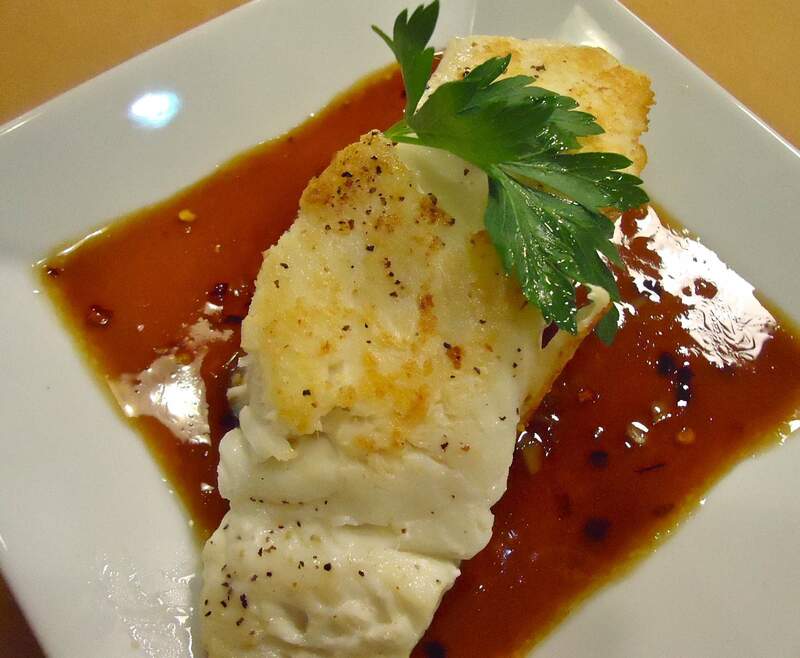 Photo courtesy of the Culinary Arts Center, Hilton Head Health. But my afternoon there was all about cooking and seafood. As part of a post that I am writing for my other blog (Hilton Head Foodie Vibe) I was invited to attend the “Seafood 101” participatory class. Led by Chef Jen Welper the packed class began by getting some basic instructions and information about the ingredients we were going to use. We were given a packet of recipes for sauces or marinades plus instructions for cooking methods for fish fillets, shrimp, and scallops. Well, I learned how to quickly “press” garlic cloves without using a garlic press the professional way. Also a great way to let some aggression by slamming your lower palm down on a chef’s knife that is pressed flat on a garlic clove. Then just mince a little – so easy. The snapper was pan seared and then surrounded by a pool of sesame ginger marinade. I learned that shrimp can be crunchy and delicious by baking in an oven and that one of my favorite restaurant appetizers, Bang-Bang shrimp, was super easy to make at home. While I do not have step-by-step instructions for the “Bang Bang Shrimp”, I am offering up the recipe, courtesy of the Culinary Arts Center, below. It is a straight-forward recipe with two parts – the sauce and the shrimp. You can make the sauce earlier and simply warm it before tossing with the shrimp too. The other two recipes we made were a sesame ginger marinade (which we used as a sauce) for a mild, pan seared snapper fillet and shrimp scampi, where we were able to use that garlic smashing technique. With the onset of the local shrimp season and plenty of fresh local fish I’ll be preparing those recipes in the future with step-by-step images and instructions. 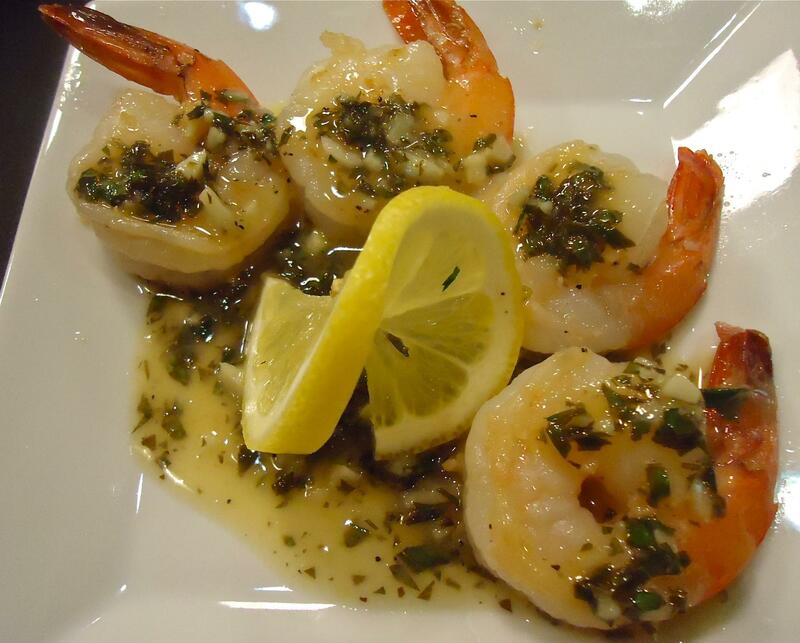 Shrimp scampi: garlicky, lemony, tasty! 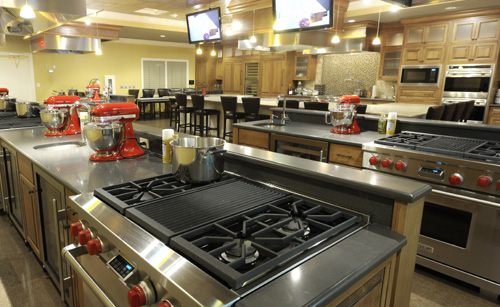 The cooking classes and demonstrations at the Culinary Arts Center are open to everyone – you do not have to be enrolled in a program at Hilton Head Health. So if you are interested in visiting the Hilton Head area and would like to include some learn’in (and cooking fun) while you’re on vacation, check it out. Preheat a medium saucepan. Mix all ingredients (except the shrimp) in the saucepan until sauce is well mixed and warm. Toss in the cooked hot panko shrimp until coated. Note: we served our sauce on the side. Serve immediately. In one bowl place Panko crumbs, pepper and salt. Mix lightly. In a separate bowl place Egg Beaters. 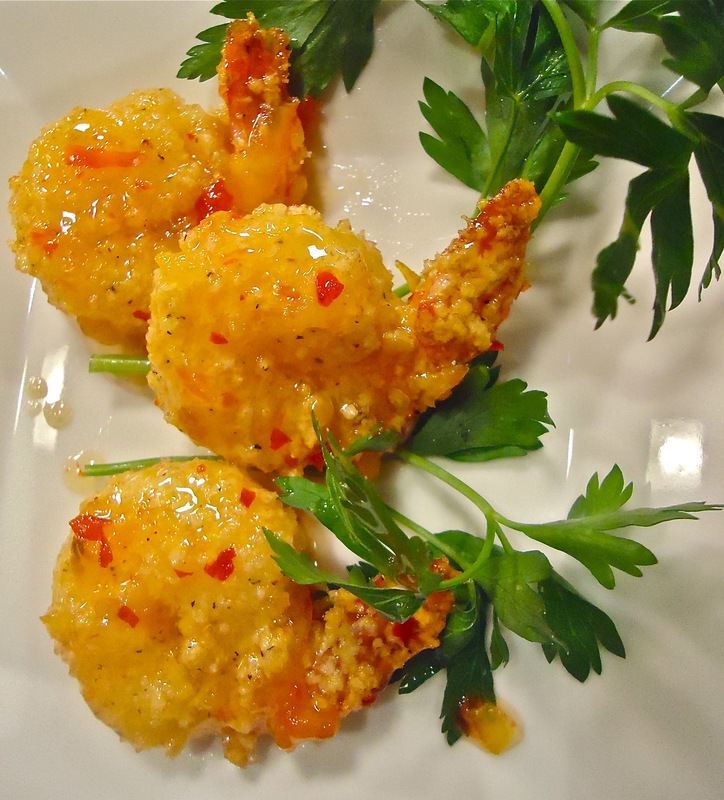 Dip each shrimp in Egg Beaters, then toss each shrimp in the Panko crumbs. Spray baking sheet or pan with non-stick cooking spray. Place shrimp on baking sheet and bake in the oven for about 15 minutes. Remove from the oven and toss with Bang Bang sauce and serve!